Technology is intervention by design. Design is the use of intellectual and practical resources to create technological outcomes that expand human possibilities by addressing needs and realising opportunities. Design is characterised by innovation and adaptation and is at the heart of technological practice. Design is informed by critical and creative design thinking and awareness of practices such as design processes and computational thinking. Effective and ethical design respects the unique relationship that New Zealanders have with their physical environment, and embraces the significance of Māori culture and world-view in its practice, innovation and relationship. Technology’s strength is that it makes enterprising use of a range of skills and knowledge of practices for exploration and communication, some specific to areas within technology and some from other disciplines. How does digital technologies fit with the technology learning area? design and visual communication (DVC). These represent the contexts and settings in which students might learn about Technology. Each technological area describes unique learning. 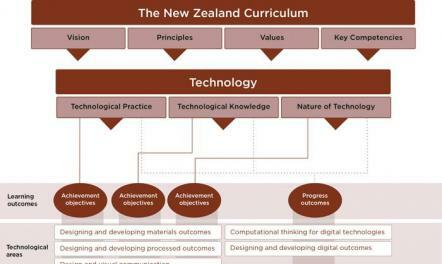 The two digital technologies areas are assessed using progress outcomes. This is different to the other three areas who will use achievement objectives as for all other learning areas in the NZC. The three strands of technological practice, technological knowledge, and the nature of technology are embedded within each of these technological areas as they provide the contexts for learning. This is evidenced in figure 1.